Using a simple and powerful genetic method to tweak genes native to two popular varieties of tomato plants, a team at Cold Spring Harbor Laboratory (CSHL) has devised a rapid method to make them flower and produce ripe fruit more than 2 weeks faster than commercial breeders are currently able to do. This means more plantings per growing season and thus higher yield. In this case, it also means that the plant can be grown in latitudes more northerly than currently possible—an important attribute as the earth’s climate warms. “Our work is a compelling demonstration of the power of gene editing—CRISPR technology—to rapidly improve yield traits in crop breeding,” says CSHL Associate Professor Zachary Lippman, who led the research. Applications can go far beyond the tomato family, he says, to include many major food crops like maize, soybean, and wheat that so much of the world depends upon. At the heart of the method are insights obtained by Lippman and colleagues, including plant scientists at the Boyce Thompson Institute in Ithaca, NY and in France led by Dr. José Jiménez-Gómez, about the evolution of the flowering process in many crops and their wild relatives as it relates to the length of the light period in a day. Genetic research revealed why today’s cultivated tomato plant is not very sensitive to this variable compared to wild relatives from South America. Somehow, it does not much matter to domesticated plants whether they have 12 hours of daylight or 16 hours; they flower at virtually the same point after planting. A well-known hormonal system regulates flowering time—and hence the time when the plant will generate its first ripe fruit. The hormone florigen and a counteracting “anti-florigen” hormone called SP (Self Pruning) act together, in yin-yang fashion, to, respectively, promote or delay flowering. In one phase of the newly reported research, the investigators studied a wild tomato species native to the Galapagos Islands – near the equator, with days and nights close to 12 hours year-round. They wanted to learn why, when grown in northern latitudes with very long summer days, this plant flowered very late in the season and produced few fruits. The wild equatorial tomato, they learned, was extremely sensitive to daylight length. The longer the day, the longer the time to flowering, whereas “when you have a shorter light period, as in the plant’s native habitat, they flower faster,” Lippman says. This suggested there was a genetic change in tomato plants that occurred at some point before or during the domestication of wild tomato plants. Lippman suspects these changes likely had already occurred when the Spanish conquistador Cortez brought tomatoes to Europe from Mexico in the early 16th century, beginning the era of the plant’s widespread adoption in mid-northern latitudes. 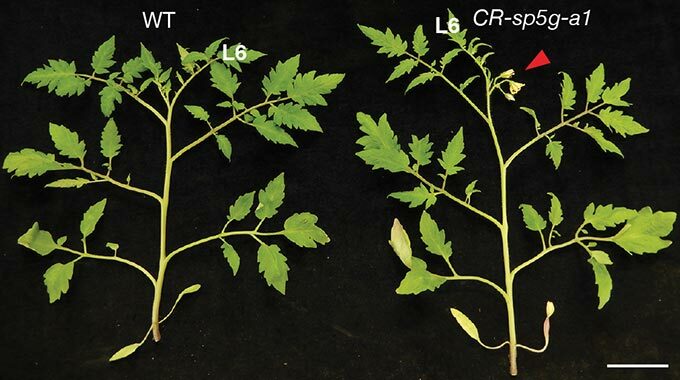 Lippman and colleagues traced the loss of day-length sensitivity in domesticated tomatoes to mutations in a gene called SP5G (Self Pruning 5G). It’s a member of the same family of florigen and anti-florigen genes that were already known to regulate flowering time in tomato. Growing the wild tomato plant from the Galapagos in greenhouses and fields in New York, Lippman and colleagues observed a sharp spike in the expression and activity of the anti-florigen hormone encoded by the SP5G gene, causing flowering to occur much later. In domesticated tomato plants, in contrast, that surge of anti-florigen is much weaker. The team’s principal innovation—generating varieties of cherry and roma tomatoes that flower much earlier than the domesticated varieties on which they are based—arises from the observation that while domesticated plants are notably insensitive to day length, “there was some residual expression of the anti-florigen SP5G gene,” Lippman says. This led the team to employ the gene-editing tool CRISPR to induce tiny mutations in the SP5G gene. The aim was to inactivate the gene entirely such that it did not generate any anti-florigen protein at all.